Casey Lartigue fills the room with both his voice and his sincerity as we settle down for our interview. 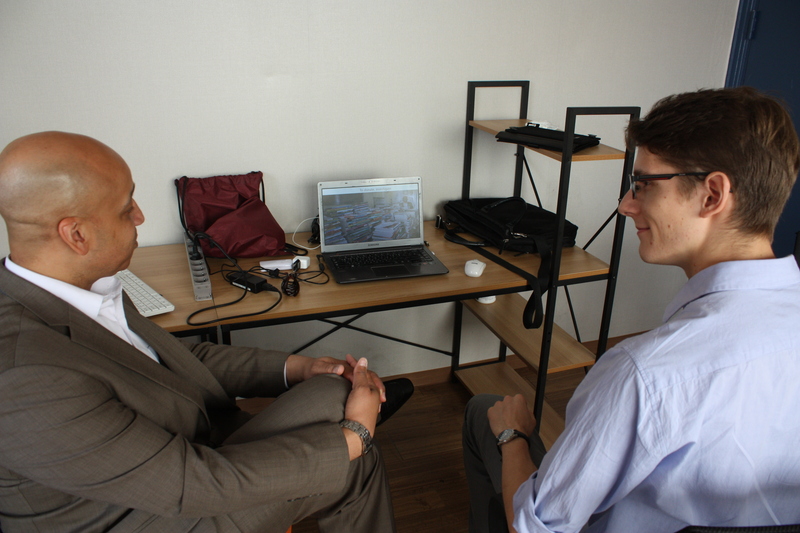 It is a pleasant reassurance to hear his English fill the room after navigating Korean since arriving in Seoul, South Korea—current home of Teach North Korean Refugees (TKNR), Lartigue’s brainchild. “I felt like I was a freedom advocate at a cocktail party,” Lartigue, who has me swing dancing across the floor of the Bitcoin office within the first fifteen minutes of our meeting, recounts. With a background of teaching English in South Korea, the Harvard graduate remembers his introduction to the long-standing question of how to handle North Korean refugees with a half smile. On March 1st, 2012 there were nearly 30 North Korean refugees caught in China and scheduled for return. It struck a bone with him, and he began to attend rallies and protests. It was during a protest that Lartigue encountered the prominent South Korean activist Park Sun-young midway through a hunger strike. Inspired, he announced his intent to “do something to help.” In return he received a virtual pat on the head. Lartigue was no stranger to giving back, even to refugees, but finding the right way to make his big words a reality was a challenge. In the end the idea for TNKR didn’t come to him in a moving epiphany; rather, as many of the best ideas do, it shoved itself through the door. Lartigue had been working as the International Advisor to the Mulmangcho School, a school just south of Seoul that educates the children of North Korean refugees. Through this involvement the refugee community knew him, and over time many adults had come knocking on his door asking for English lessons. Despite his experience teaching in Korea, Lartigue does not view himself as a teacher and declined many of these requests. It wasn’t until 2013 that his unintended ego dropped out of the situation and Lartigue had a valuable realization—the refugees weren’t asking him to teach English because he was the end all be all of English teachers. They were asking because they wanted to learn English. Under the influence of this realization in March 2013, Teach North Korean Refugees was born. 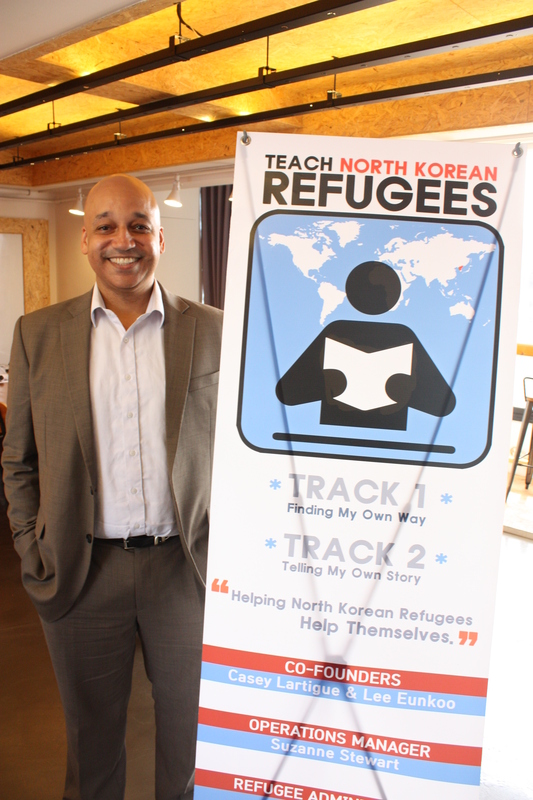 TNKR works on a monthly basis with approximately ten North Korean refugees and 15 tutors, though in the past month they have had over 29 new tutors join the program. It predominantly serves as a matching service, pairing tutors with students and vice versa. However, early on in the organization’s history the matching process led to an argument that nearly ended it then and there. 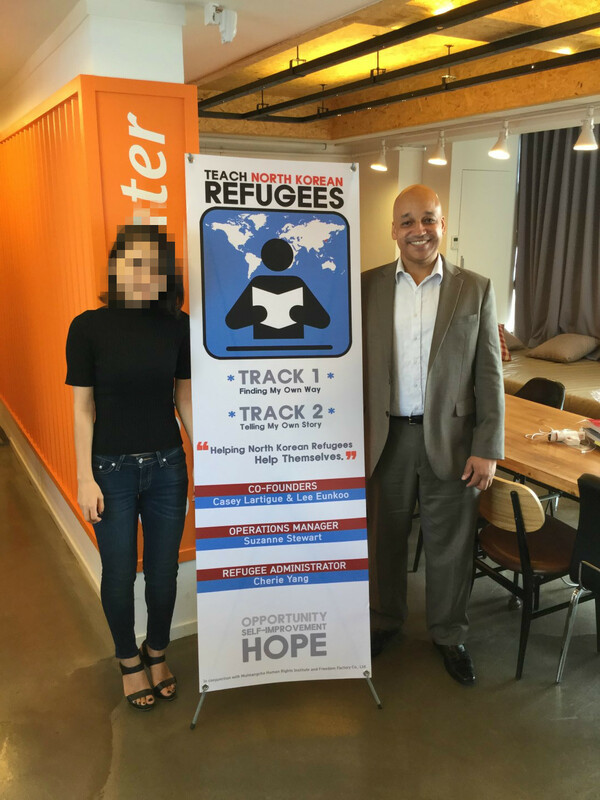 After the first session at which Lartigue and co-founder Lee Eunkoo helped match tutors to students, Lartigue pushed back against the structure, claiming that the refugees would benefit more from the autonomy and responsibility of choosing a teacher on their own. This idea was shot down on the basis that the refugees did not come from a background of autonomy and would not adjust to that level of autonomy well. He fought back, and two years down the line a 50-person waiting list speaks loudly to the success of his model. TNKR students can choose from one of two programs: “Finding My Own Way” or “Telling My Own Story,” both centered on the acquisition of English language. As Lartigue puts it, “the burden is on the refugees.” This burden, as he calls it, includes choosing between two to three tutors, deciding on a class schedule, and attending at minimum two ninety-minute sessions a month. The minimum seems superfluous; on average refugees attend class nearly once a week, some traveling almost two hours on the subway over four different lines to attend. Tutors match this enthusiasm, with one even flying in once a month from distant Jeju Island. The demand has quickly outpaced the supply, and as we talk in the office a class is being held with a wait-listed student in the other room. We break from the history of TNKR to observe. It is the refugee’s first class, and only the tutor’s second. The nerves show through as Lartigue helps to translate using his basic Korean, which is how we end up with the sentence “I like to dance,” and whirl across the room. The class is an example of in-house tutoring, a system created to accommodate for the increased need. Yet Lartigue cites something else entirely as TNKR’s biggest challenge. “It is imperative that people don’t come in passively. ‘How can I help?’ is the worst question I get asked,” Lartigue laments. It is the first time in our hour of conversation that his friendly exterior begins to show seams. “You don’t have to teach,” he says, “but consider your role! What are your strengths? Do the thing that you can do well!” TNKR needs a marketing team desperately, but could also benefit from web design, legal and business backgrounds. In fact, there are few groups that Lartigue excludes from potential volunteer categories. The ability to help is dictated by who you are, and if you’re the next Bill Gates then the best way to help is to donate. His second frustration is money, a common refrain in the NGO world. TNKR is rapidly outgrowing their space at Bitcoin, a small but well-lit center on the third floor of a building outside the Itaewon subway station. TNKR does not accept government money, preferring to maintain freedom to adjust the goals and capacity of the organization as the needs of its constituents grow and change. However, refusing to accept government funds means crowd-sourcing the funding for the free tutoring services that TNKR offers. Tutors all serve as unpaid volunteers, and yet there are more volunteers to teach than the center can sustain at its current level. Space, however, requires money for rent. In a system where NGO corruption scandals emblazon headlines, people want to be sure of where their donation money is going. Having put over $10,000 of his own into the organization, Lartigue understands this sentiment, but laments its effects. Referencing the United Way scandal, he insists that a $10,000 organization cannot be treated like a $10,000,000 dollar organization. He acknowledges that NGOs deserve some of the blame, but frets over the impact it has on donations. His advice? Donate where you understand. We met with one of these volunteers while we waited for the English tutoring session outside to conclude. Jungming “Jenny” Lee, a South Korean student preparing for law school, works as an in-house tutor for students on the wait-list while they wait for more permanent placements. She cites the book “Nothing to Envy” by Barbara Demick as the reason she first really considered getting involved with refugees, but regrets that it took a Western catalyst to get her involved. “As much as I appreciated the book,” she says “it was quite sad that it from Western [sic], a white person, and Casey is also an American. And, I know we are ‘one nation, one people,’ but a lot of South Koreans still have a lot of stereotypes to North Koreans [sic], and I was one of them.” TNKR has changed that perspective. As she puts it, the gap has been destroyed. Jenny recounts working with North Koreans on everything from teaching the ABCs to preparing for interviews for law school. “He’s my competition,” she jokes. As Jenny speaks of the positive influence TNKR’s “small scale unification” has had on her own perspective of North Koreans, both refugees and those still in North Korea, the class outside finishes up, and we head out to meet both student and tutor. The student refugee withheld her full identity, as many do. It is unsafe to be seen in pictures or named online, as many of the refugees that TNKR works with are officially considered dead in North Korea and need to stay that way for the safety of family members who remain north of the DMZ. Jenny volunteers her services as a translator. A beautiful, well-dressed, and soft-spoken woman, our student refugee looks a little nervous at being interviewed on her first day of class. We assure her that any pictures will be mosaicked. “I am studying English to be good at it,” Jenny translates. She has been interested in learning English “as far back as I can remember.” Her lessons in North Korea were very basic, and when she learned of TNKR through a friend she was excited about the opportunity to study English one-on-one. Her first class was good, and she is personally committed to learning. Her attitude highlights Lartigue’s confidence that refugees are truly ready and able to take their English education into their own hands. Her tutor, she says, was very “understanding,” a trait she says is the most important thing to find in a teacher. After a few minutes of talking to Bridget I must agree; she seems both capable and understanding. Though her teaching experience is limited to having taught conversational English to French-speaking women, she is excited about the opportunity to volunteer in a capacity where her job is clear. It is something that comes, it seems, with the territory of a small organization run on a personal level. “Don’t wait and sit around. Come in and do work.” That is what is important. It is an appropriate sentiment, one that seems to embody the past, present, and future of TNKR. Lartigue’s desire for “ownership at a local level” and desire to turn “adaptive change” into a business model show through on every level of the organization. “How can I help” is a question that he clearly came ready to answer.